A Rinkya Blog: Catch A Live Lobster! Bored of the usual UFO catchers from Japan? No Boobies For you? and definitely not Dehydrated food? 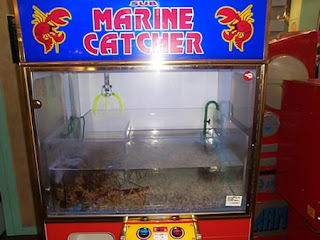 What about trying for a live lobster? A bit more challenging, as they will move away from a steel claw grabbing at them, but what a way to impress! For your favorite UFO Catcher prize from Japan, check out YJ auctions and bid with Rinkya!